Near the center of the city was a tall building with a smooth dome ceiling bearing a Stella design on it. There was a hole with the end of large telescope passing through it, pointing right at where the moons would be. He’d seen it a few times while walking around, and had even approached it once, but the facility had been closed during the day. Now he’d finally get to see what it actually was. He hoped it was late enough anyway. Getting up to it was a hassle though, one Pizaru wasn’t too keen on repeating. The actual entrance to the building was high above the ground, and so in order to get to it, he had to climb a seemingly endless amount of ramps and stairs. If there was an elevator around, he sure hadn’t seen it. Luckily for Pizaru, his inherent ability to float made the process much more bearable. Ahh finally…! How do they expect people to get up here. Especially if they’re as small as I think they’re going to be, he thought, taking out the pencil Remias had given him, which on closer inspection has a shiny holographic pattern on it’s surface. He also unfurled the map from the hole in his ear. With a few strokes, he noted down that the building only opened after dark (something he’d forgotten to earlier) while simultaneously walking toward the door. After finishing, he put the map back through the hole in his ear with one hand, and continuously twirled the shiny pencil with his other. I hope it’s open now… I’d hate to have to wait even longer, he thought hopefully, as he reached for the door nob. Twisting it, he moved his weight into the door. “Beh!” He sighed, “I guess I have to wait.” And so, adamant about seeing what this place was, he sat there. “Uhh… hey? Sorry about the door thing, uh…” He said, not knowing what to say. “Luminkeau!” She squeaked as she turned tail and escaped back into the door. “H-hey!” He said, automatically chasing after the lumimi as she retreated. Pizaru slipped inside after her just as the door closed. The lumimi took a quick route through the floors that led straight to the large telescope, where another larger lumimi was calibrating it for the night’s service. A bunch of tools were floating around him, being kept up by his Psychic mythe. The violet lumimi slowed down as she approached the orange lumimi’s back. “Ake, ondedu din vuun en beami.” He said, lightly tapping on the telescope with his paw in satisfaction. “Maishi!” He cried loudly before picking himself up, as well as the other lumimi, Maishi, with his Phychic mythe. “…Zoza Gyalu,” she squeaked, dropping the pencil she was holding in her mouth. It had a large groove from where she’d bitten down on it. The larger lumimi, Gyalu, eyed the pencil with suspicion. “Uu Maishi… ve mesyada hayan fyova meisu luminkeau liiei lua?”, Gyalu asked sternly, psychically levitating the pencil away from her. “Can I have that pencil back? It’s kind of important…!” He asked. “Tse kyabe ean en sonazyen lua?” he said, motioning toward the floating pencil. “Yeah…uh…” he stammered, not expecting to hear the language Gyalu was speaking. “I was just waiting for when this place opened up. For a long time too… Until she stole my pencil!” Pizaru said pointing at Maishi. Gyalu sighed. “Maishi, say sorry,” he asked. “S-sahree!” she said, awkwardly trying to speak rikuunae. It was very apparent to everyone that she wasn’t very fluent at all. “Actually, the observatory doesn’t open for another few minutes. You didn’t even come in from the entrance!” Gyalu said. “Here, come with me and I’ll show you.” Gyall said, beginning to move toward the bottom floor to retrieve the tool box. He waved Maishi along with as well. “Well I might as well stick around…” Pizaru said joining Gyalu. 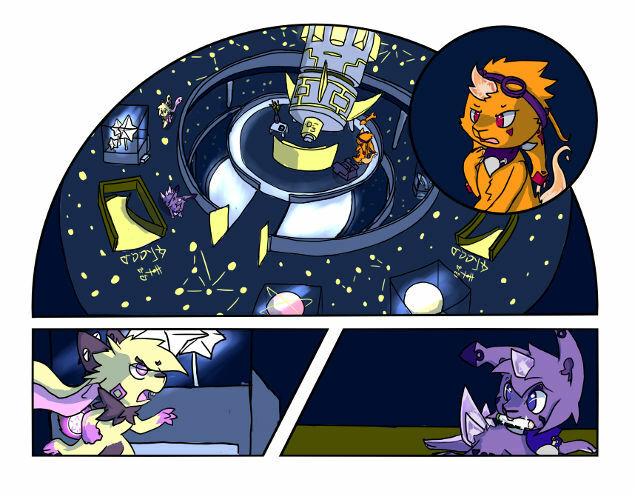 Gyalu, Maishi and Pizaru headed down the long paths of the observatory. Pizaru had taken interest in many of the displays they’d passed by, only to have his questions declined by Gyalu, who was just focusing on getting the toolbox. At the same time, Maishi was slowly inching closer and closer to Pizaru, her eyes darting between his face and his shiny pencil. She could never get too close before Pizaru would suddenly change course to look at a new display, staying silent through the whole ordeal. Finally they’d reached the bottom floor. Gyalu hopped to the tool box. “Yes, show Pizaru to the entrance, and unlock it while you’re there. I’ll be with you in a minute.” Gyalu said before hopping off to put away to tool box. Maishi looked at Pizaru for a second, before suddenly going off to the door at a steady pace. Pizaru jolted forward to catch up, caught off guard by the lumimi’s sudden movement. “So what now?” He said as Maishi shuffles around with the key in order to get it into position. “Loox,” she said as she pointed the end of the key at the metal door. Her mythe horn started glowing, and before long the key was also surrounded in a ball of violet light. The light began concentrating around the end of the key before shooting forward at the Key mythessence symbol on the door. The outlines of the symbol glowed momentarily before fading back to their original color. “Wow.” Pizaru said opening the door to see if it actually was unlocked. Behind the door was nothing special. Just a small hallway leading to a set of double doors on the other side. Pizaru noted how similar the design on the doors seemed. He soon found out that there was no one around to answer his question. He’d been stymied for a second time in a row. “…Man, she’s so weird.” Pizaru muttered to himself. He waited around for a while to see if she would return, leisurely floating in place while he waited. I see what Remias was talking about before, I guess disappearing is annoying… He thought, She’s a lot better at it than me though. Maybe I should get some tips…! “Have you seen Maishi? She disappeared before I could ask her what your name was!” Pizaru said immediately, hoping a question of his would finally get answered after being denied for so long. “Uhuh…,” Pizaru said, contemplating the possibilities. Pizaru floated over to him. “Is it usually this empty?” He asked as they started moving toward nowhere in specific. The two approached a model of Rikuuns smaller moon Menulisc. Pizaru examined it’s rings as Gyalu continued. Pizaru looked toward Gyalu. “Wow, there’ an outlaw running around Vene- wait a second.” Pizaru said, turning slowly to Gyalu.”…Astrology reading?” He said. “No no, its pretty okay! I’m just not a fan of the stuff!” Pizaru said nervously, anxiously looking for something else to focus on. “You do that. And please, if you want to know something, don’t hesitate to ask me!” Gyalu said, letting go of his suspicious for the time being, and Pizaru darted to the next exhibit that caught his eye.